The close cousin of “artery-clogging saturated fat” is “heart-healthy canola oil” – which should be your first clue that maybe all those suspiciously cheap bottles of golden liquid aren’t so great for you after all. And indeed, one of the central tenets of Paleo has always been that seed and vegetable oils – soy, canola, peanut, and the rest of the crew – are major contributors to modern disease. But how, and why? It’s not just because they’re “unnatural” (that word is almost meaningless anyway); it’s because they’re very high in polyunsaturated fat (PUFA), specifically the Omega-6 type. Omega-6 PUFA, found abundantly in nuts, seeds, soy, and oils made from them (including “vegetable oil”). Omega-3 PUFA, found abundantly in fish and seafood, with smaller amounts in fat from grass-fed animals. We can also get the precursors for Omega-3s from plant sources (like flax seeds), but human bodies just aren’t very efficient at converting those precursors into Omega-3s themselves, so it’s better to get the Omega-3s directly. In a nutshell: too much Omega-6! The problem isn’t that Omega-6 fats are “bad” in the abstract. We actually need them: if we don’t get them, we’ll die. But we don’t need a lot of them. As far as we can tell, the ratio of Omega-6 to Omega-3 in ancestral diets was something between 1:1 and 4:1. But in modern diets, it’s around 10:1, thanks to the amazing amount of vegetable oils we eat. This imbalanced ratio of Omega-6 to Omega-3 fats is a problem because it’s inflammatory. The inflammation from excessive Omega-6 exacerbates all other kinds of inflammatory health problems, including familiar faces like obesity, diabetes, autoimmune diseases, depression, and heart disease. It’s not that PUFA overload really causes any one particular disease; it’s that it gives all kinds of other diseases a nudge in the wrong direction. But if Omega-6 fats are so inflammatory and unhealthy, then why do they get such a good reputation as “heart-healthy?” As it turns out, they’ve really been piggybacking on the Omega-3s! Does PUFA Improve Heart Health? In plain English: adding Omega-3s and Omega-6s is beneficial. Adding only Omega-6s is harmful. And that’s not surprising at all when you think about what it actually means in terms of ratios. In other words, these studies don’t show that eating more PUFA is good for you. They really show that improving the ratio of Omega-6 to Omega-3 fats is good for you. The American diet is so astonishingly deficient in Omega-3 fats that people still benefit from adding them even when they come along with Omega-6s. But that doesn’t mean the Omega-6s are healthy! The next big question, of course, is “what does this actually mean in real food?” Nobody eats grams of PUFA; people eat fish, or almonds, or tofu. And unless you really love doing nutritional math, you probably want to know what a healthy fat intake is in the real world. Avoid soy, “vegetable oil,” peanut oil, corn oil, canola oil, and other highly concentrated sources of Omega-6 fats, especially if they’ve been deep-fried or otherwise exposed to extreme heat. Eat nuts and seeds in small amounts, not as staple foods. Eat plenty of fish and seafood – approximately 1 pound of fish per week is a good goal. Do not just add more Omega-3s onto a diet rich in Omega-6s to “balance it out.” This doesn’t work. You cannot “erase” the effects of a bunch of tofu by slugging down a shot of fish oil. Instead of adding more Omega-3s, lower Omega-6s. Keep it proportional. Most foods that contain fat contain a little Omega-6, but there’s no call to go crazy over olive oil and avocados. Before you avoid a food for fear of Omega-6 fats, look up exactly how much it contains: you might be surprised at how little it actually is. Canola oil is not a health food – especially not for your heart. The line that “PUFA lowers cholesterol/reduces the risk of heart disease” is true only if “PUFA” includes Omega-3 and Omega-6 fats: Omega-6s on their own are likely to make the problem worse. 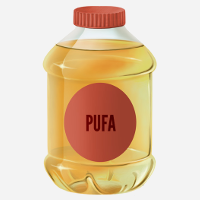 For overall health, a good general plan is to keep overall PUFA intake low, especially the Omega-6s. Ditch the seed and vegetable oils and all the soy products, and keep nuts and seeds to small amounts. Make sure you’re getting enough Omega-3s by eating plenty of fish and other seafood, but don’t try to “make up for” too much Omega-6 by piling on more Omega-3s: it doesn’t work that way! Most importantly, don’t stress out over otherwise nutritious foods just because they have some Omega-6. As long as you’re avoiding the biggies (seed oils and soy) you’ll probably be just fine. Enjoy plenty of Paleo-friendly fats like olive oil, coconut oil, and animal fat, and try to have some kind of seafood at least once a week: your Omegas will take care of themselves.